Small Jolly Fat Santa stands approx. 14" high . Wearing a red coat and holding a tree. These are currently being crafted now and will begin to arrive in June 2019. We are taking pre-orders for these as they will sell out very quickly. Anyone that pre-orders these will get priority on them and they will be delivered as soon as they are completed. 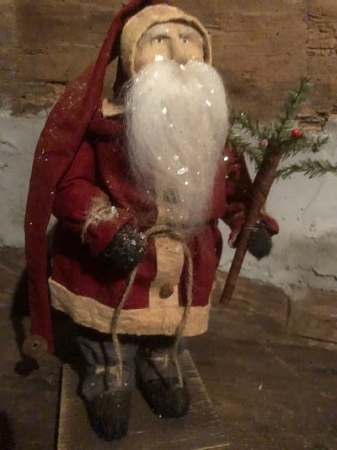 Arnett's Santa Wearing Navy Ticking Coat Holding Gingerbread Man and Candle 22"